the sending home of two officials. According to Government sources, the Board expressed concerns in recent times over the Remigrant Scheme, the 1000 Homes project at Providence and the management of the house lot distributions. There are also concerns also over the recent announcement of an ambitious 50th Anniversary housing programme to have persons only pay half down on a house lots and have the rest written off. Board officials have been complaining that they have met stumbling blocks in receiving information requested from CH&PA staffers. The requests pertained to several transactions to the tune of billions of dollars that the entity had embarked on. The transactions also included large plots of land along the East Bank Demerara that were sold under questionable arrangements to 20-odd private developers. Many of the developers were close friends of the previous administrations. Some of the plots were flipped for tens of millions of dollars more without any work being done, in breach of CH&PA agreement. The Authority did little to enforce the clauses. Chairman, Hamilton Green, had expressed unhappiness over the requested information and said that the Board has ordered the Authority to cease work on building new turn-key homes in Providence pending an assessment. Many of the homes, under the project launched by former President Donald Ramotar and ex-Housing Minister, Irfaan Ali, are in poor shape because of sloppy construction. Many of the owners have complained officially about the quality and the Ministry of Communities, which is charged with housing, has announced plans to spend monies to fix the defects. Overhead shot of the 100 acres plot of Sunset Lakes, now controlled by Chinese logger, BaiShanLin. What makes the housing sector so worrisome also for the David Granger administration, which came to power last May as a result from early elections, is the fact that there are more than 25,000 applications for house lots on file. 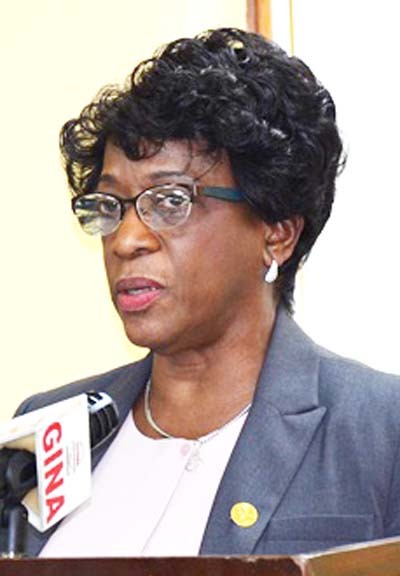 The Land Administration Division of CH&PA, headed by Denise King-Tudor, has been under pressure. So too is the Chief Executive Officer, Myrna Pitt. Government is on the back-foot to open new lands in a hurry. The questionable disposal of hundreds of acres of lands on the East Bank of Demerara with little monitoring to ensure that there is compliance by developers to meet deadlines have been angering the public. Several plots are lying without much work done although it would have been handed over as much as five years ago. At the Remigrant Scheme, several questions have been raised over the conditions under which persons benefitted from lands at Providence. It appeared that CH&PA decided who can be considered a remigrant without that person actually fitting the bill.